You’ve been hearing it a lot in the news. Chemical leaks, spills, fires, and explosions – sometimes lethal. There are ways to prevent these hazards from occurring and even ways to reduce damages, should they occur. This is achieved by storing chemicals in approved, compliant chemical storage units. Chemical storage units are a great way for businesses to stow hazardous materials in a way that is safe not only for the chemicals, but for personnel and clientele, as well. Businesses that require a large quantity of hazardous materials – whether they’re manufacturing, distributing, or handling the chemicals in some other way – should store their hazardous materials to protect their employees from the dangers associated with hazmat storage. 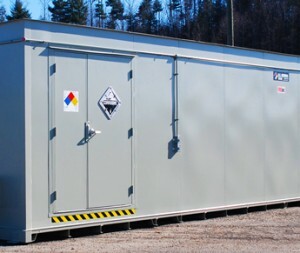 Even for small quantities – chemical storage units can come in almost any size and even the smallest amount can pose a risk to personnel. Chemical storage units from U.S. Chemical Storage are designed for safety and compliance. Your chemical storage units should be fully customized to suit your hazardous material. This ensures that the proper conditions are met to mitigate hazards and maintain your chemicals. From the storage unit size, to the number of racks, to optional accessories, you have full control over your chemical storage conditions. Our accessories are available to help you customize your chemical storage units, letting you control the environment and ensuring that all chemical storage regulations are met. Certain systems are available as fire-, explosion-, vapor-, and/or dust-proof, so whatever you intend to store, you know we can design your chemical storage units to effectively mitigate hazards while creating a safe, convenient chemical storage area. With accessories such as fire suppression to protect against fires and mechanical ventilation to prevent the buildup of toxic or corrosive fumes, our chemical storage units are the first step toward safeguarding personnel against chemical hazards. There are a number of other great accessories available from U.S. Chemical Storage to protect your personnel and help you achieve compliance.